miniOrange provides a ready to use solution for WordPress. This solution ensures that you are ready to roll out secure access to your WordPress site using miniOrange OAuth Server within minutes. Step-by-Step Guide for WordPress Single Sign On (SSO) using miniOrange OAuth Server. 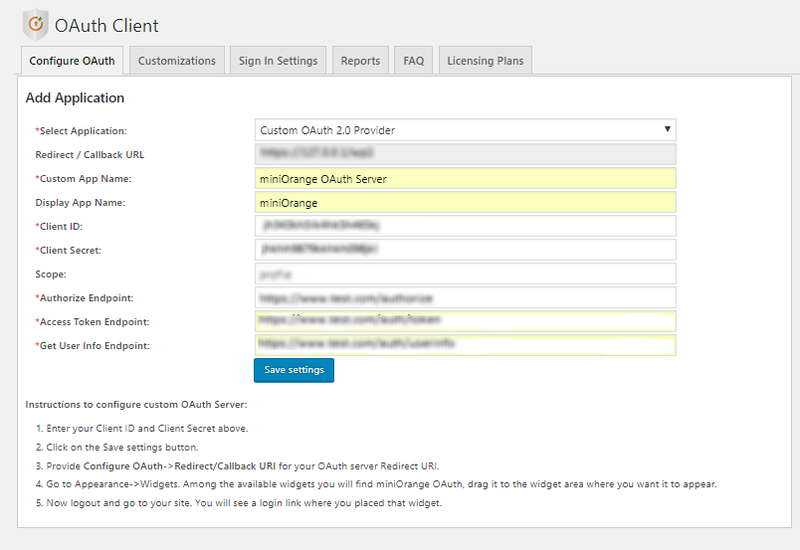 STEP 1: Install and Activate miniOrange OAuth Server plugin and register. To download the plugin Click Here. Go to OAuth Client tab and add client by clicking on Add Client button. Once clicked on Add Client, you will have to enter Client Name and Authorized Redirect URL. Go to STEP 3 to get Authorized Redirect URL. Once saved, you will get Client ID and Client Secret. Go to How to Setup? tab. You will get Endpoints and Scope there to configure OAuth Client plugin. In miniOrange OAuth Client plugin, go to Configure OAuth tab. Select Custom OAuth 2.0 Provider under Add Application. Enter the Custom App Name you want to see on OAuth Client Application list. Lets say, Custom OAuth Server. If you want a different application name to be displayed on Login Button then enter Display App Name, Ex. miniOrange. Enter Scope and Endpoints copied from OAuth Server and click on Save Settings. Click on Test Configuration and you will get Attribute Names and Attribute Values there. Enter the Attributes Names under Attribute Mapping section and save it. 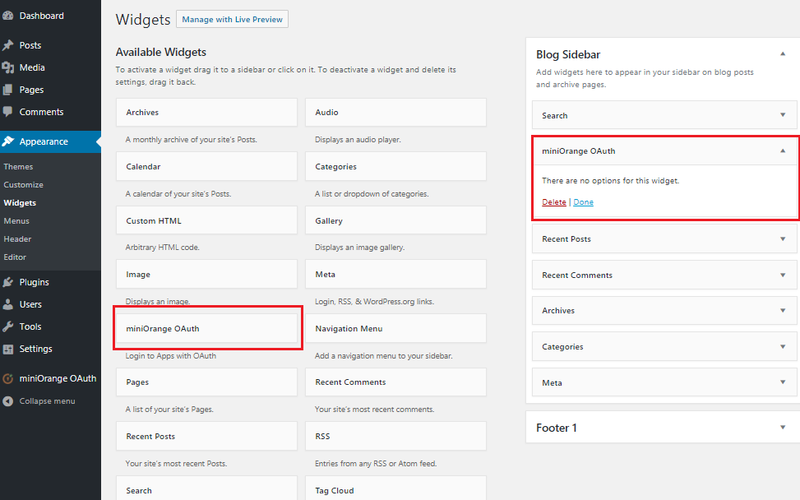 Go to WordPress Menu -> Appearance, click on Widget. Drag miniOrange OAuth widget to a sidebar. Go to your Site to test the Widget. Click on Login button and login using the credentials of your OAuth Server. You will be able to log in. If you are facing any issue, please contact us at info@miniorange.com or call us at +1 978 658 9387.